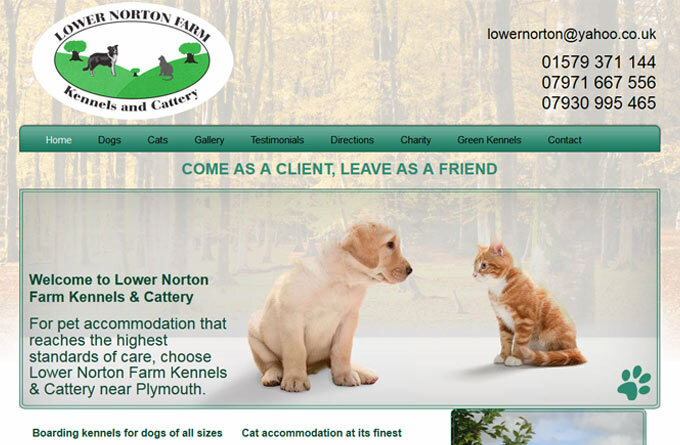 Lower Norton Farm Kennels are based in Callington, in Cornwall. Our kennels accommodation was purpose built and specially planned to ensure that dogs settlein quickly and feel at home during their stay with us. Designed to ensure high standards of hygiene, the accommodation offers full thermal and acoustic insulation, so all dogs feel relaxed, peaceful and comfortable. The accommodation is spacious, with individual play pens, relaxing background music and is fully heated. The accommodation is laid out in a way that prevents dogs being able to look directly into the opposite pen, so helping any shy dogs which might feel unsettled by a more boisterous neighbour. Our dog pens are large enough to accommodate up to two or more large dogs from the same family if required. Outside, all the runs are covered and open-fronted, so the dogs can have plenty of fresh air and stay dry. Sleeping areas have controlled under-floor heating installed, allowing the dogs a choice of sleeping on either a heated or cooled area. Dogs are walked at least twice a day, usually through the farm woods. This ensures they have a good change of scenery and allows us to get to know them individually.